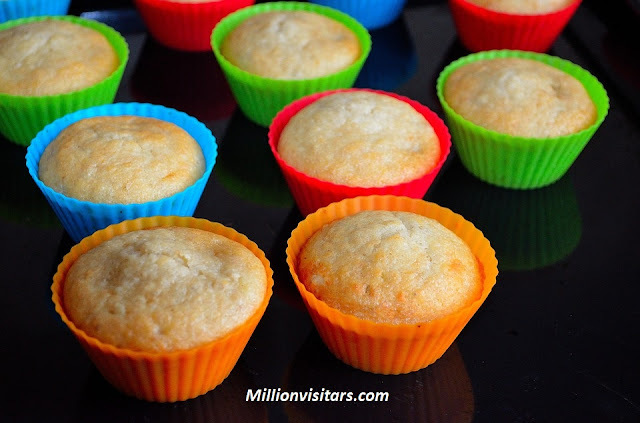 Hello And Welcome To Millionvisitars, Today we are going to learn how to make mango muffins or mango pancakes at home. Firstly admix baking powder, baking soda, and flour and sieve it 2 times. Now in another pot take condensed milk, mango pulp, vanilla essence, and butter mix these ingredients very well. After that gently mix the flour and make sure that there are no bubbles, And add 2 spoons of milk. Preheat the oven at 200c, kept these in the oven for 15-20 minutes. Take a look if it is looking like a cake and it is coming out from the cup then our cakes are ready, serve to your children and this can also be a part of tiffin.